Etch A Sketch: Shake It Up, America! Etch A Sketch®: Shake It Up, America! BRYAN, Ohio, March 30, 2012 -- Ohio Art's Etch A Sketch® found itself at the center of U.S. politics last week, drawing up an abundance of attention and elevating the iconic toy to political icon. To maintain the classic drawing toys political neutrality, a series of three new ads developed by Team Detroit, Ohio Art's advertising agency, are slated to hit social media channels today. "With Etch A Sketch® shaking up the political debate, it was our desire to develop a campaign that encourages Americans to get involved in the process and vote," says Martin Killgallon, Senior VP Marketing & Product Development at Ohio Art. "We feel these ads are fun and engaging and will continue to keep people interested throughout the remaining presidential campaign." "Etch A Sketch® doesn't take political sides," said David Maas, Senior Vice President – Group Account Director from Team Detroit. "We believe that when the left hand and the right hand work together, magic happens and these ads were developed to convey that message." The campaign launched on Facebook and Twitter along with a series of clever posts and tweets. 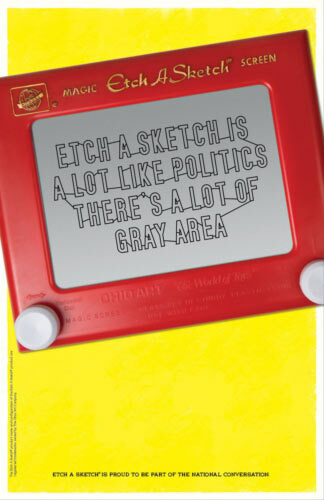 The ads feature fun visuals and catchy slogans such as "Etch A Sketch® is a lot like politics, there's a lot of gray area," "Politically we lean right down the middle, which way did you lean?" and "We have a left knob and a right knob for each political party (But remember, when both work together, we can do loop de loops)." The ads also drive consumers to a revamped Etch A Sketch® "Shake It Up, America" website where consumers are encouraged to exercise their freedom of expression, register to vote or purchase product. Soon to come, consumers will also have the ability to select a blue Etch A Sketch®, which represents the Democratic party or red Etch A Sketch® that represents the Republican party, and cast their vote in an informal presidential poll. To learn more about the new Etch A Sketch® "Shake It Up, America" campaign, visit http://www.etch-a-sketch.com. Creators of the famous Etch A Sketch® drawing toy, which recently celebrated its 50th year anniversary. The Ohio Art Company remains one of the world's most widely recognized toy companies since its establishment in 1908. The Ohio Art Company is committed to developing innovative toys that encourage creativity and learning while providing hours of enjoyment, encouraging self-expression and promoting positive development. The company also markets specialty award winning toys including K's Kids®, a line of toys specially developed for babies and toddlers, nanoblock®, world's smallest building block system and CLICS®.